We got over a foot of snow here in Jersey on Friday and heard the Connecticut area got it far worse than us with over three feet of snow! I can’t imagine having to dig out of all that snow! I went out to shovel during the storm just to get a head start so shoveling the next day wasn’t too bad. This is some serious back breaking work but the best part is coming back inside to warm up and relax to a warm and hearty meal. I have always loved snowy days for this, knowing my Mom would have a hot meal for us after a day of snow angels, igloos and snowmen. Today I still want to play in it but instead do the necessary clean up, clear the car, slush around the city in my comfy boots and puffy coat, watch my dog hop around like a little bunny (he hates the snow! ), then come back inside for an awesome meal. And I can do all this with my awesome slow cooker without having to fuss too much in the kitchen. So while you’re out playing, shoveling, organizing your cupboards or what ever you do when you’re snowed in, make this wonderful spicy dish popular in many Latin American homes. 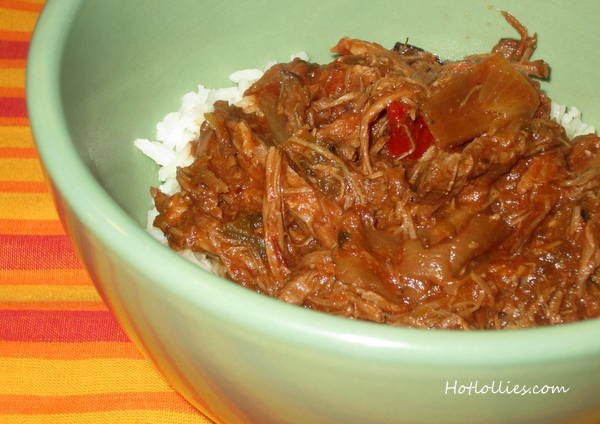 Ropa Vieja, or old clothes, is a well spiced, boldly flavored shredded beef dish served over white rice. It’s the comfort food I crave during cold, snowy days like these. This isn’t a dish that’s high on the heat index and most restaurants will serve a hot sauce on the side but I like mine spicy and have turned up the heat in this recipe. This is one easy recipe where you pretty much just toss everything in and let the slow cooker do its thing. Before you do that though add the onions first. Having the onions on the bottom helps “prop” up the beef and ensures it does not stick to the bottom of the cooker and burn. I used this older slow cooker because my roast was only two pounds but the more modern cookers may have a built-in rack. If that’s the case then you don’t need to add the onions first. 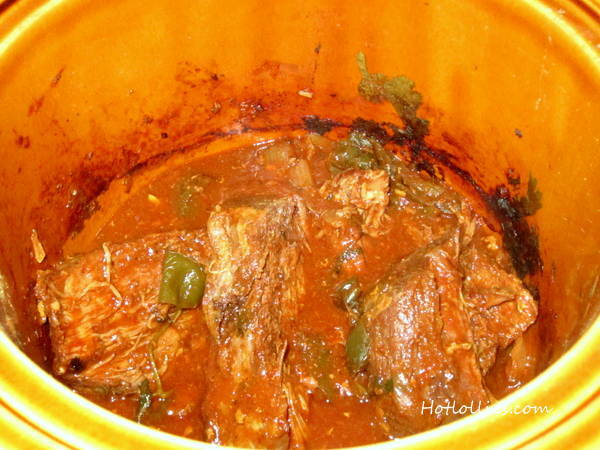 Add the remaining ingredients and set the slow cooker on high until the meat is fork tender. The meat will release a lot of juices but will eventually burn off during the cooking process so if you are like me and like a saucier dish, just add a little water and tomato paste. Just make sure you taste it to ensure the seasoning is right for you. Once the beef has finished cooking, remove from the slow cooker and onto a cutting board for shredding. 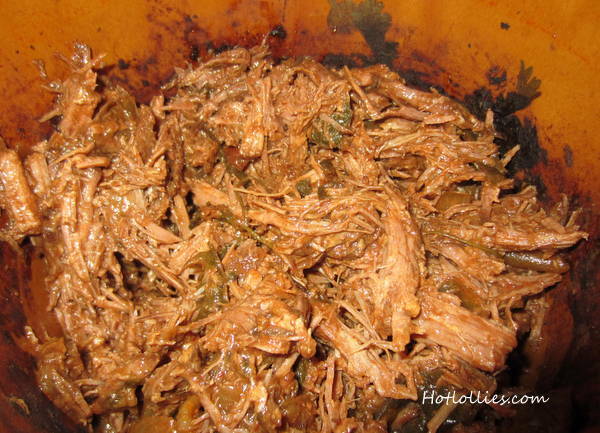 After you have shredded the meat with a fork just add it back to the slow cooker and stir well. You can serve the beef over rice, have it with plantains or make a sandwich, this is a dish that will pretty much go with anything. Any leftovers can be frozen if you are not planning on having it within a week. 1. 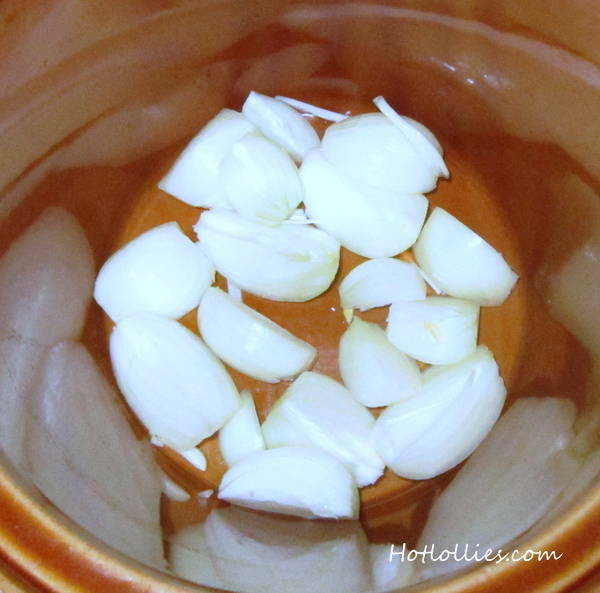 Turn on your slow cooker and add the onions to the pot. 3. Cook on high setting for 4-5 hours or until the beef is tender enough to pull apart with a fork. 4. Transfer the roast to a shallow pan or cutting boarding and pull the meat apart with a fork. 5. 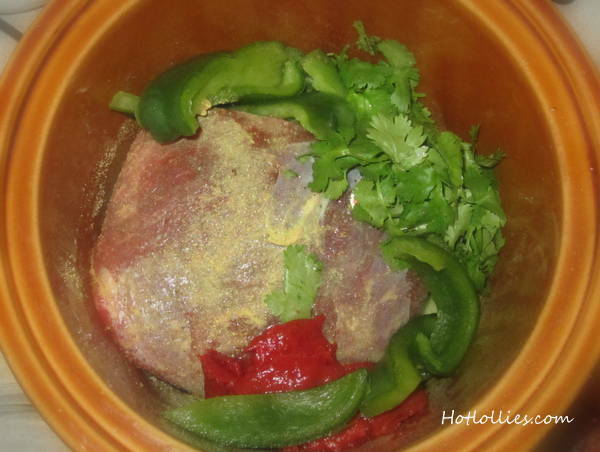 Add the meat back to the slow cooker and mix well with the remaining juices. If meat isn’t saucy enough you can fill the 4oz can with water and add to meat. Add a little more Adobo seasoning if needed to adjust to your tastes. 6. 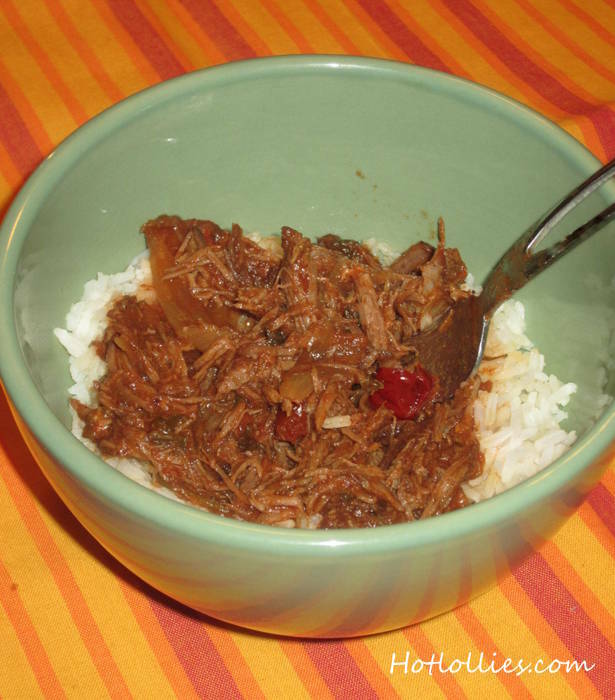 Serve shredded beef over cooked white rice. Have you made a weight loss resolution for this new year? Well you and probably most in your circle have but if not there is no reason to stop eating healthy. One of my favorite snacks to munch on during the day is hummus. It’s packed with protein, fiber and is low is fat. Add a few baby carrots or slivers of bell peppers and you have a mini meal that will help you through your mid morning hunger pangs or hold you over until dinner. I’ve been wanting to make my own hummus for some time now but the plastic wrap on my food processor stopped me! I know, I know, pure laziness, but some appliances can be a bit overwhelming with all the assembling, and cleaning and storing. Actually, to my defense, I’m always using my blender, my Kitchen Aid mixer, which I love, and my juicer so getting out another appliance to just make hummus was a bit much, especially when Sabra’s jalapeno hummus is so good! 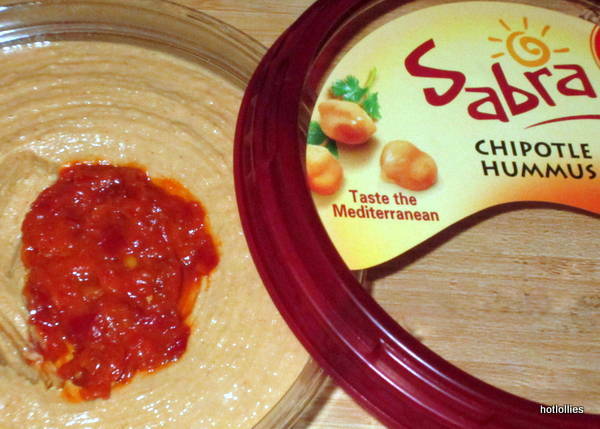 Sabra’s Jalapeno and Chipotle hummus are my go to hummus products. Spicy, bold, stinging heat in the jalapeno hummus so if you can’t take the heat don’t stir up the chopped jalapeno that tops the hummus. You can play it safe and just add a bit of chile at a time. If you like lots of heat like I do, stir it all up for a really spicy bite. 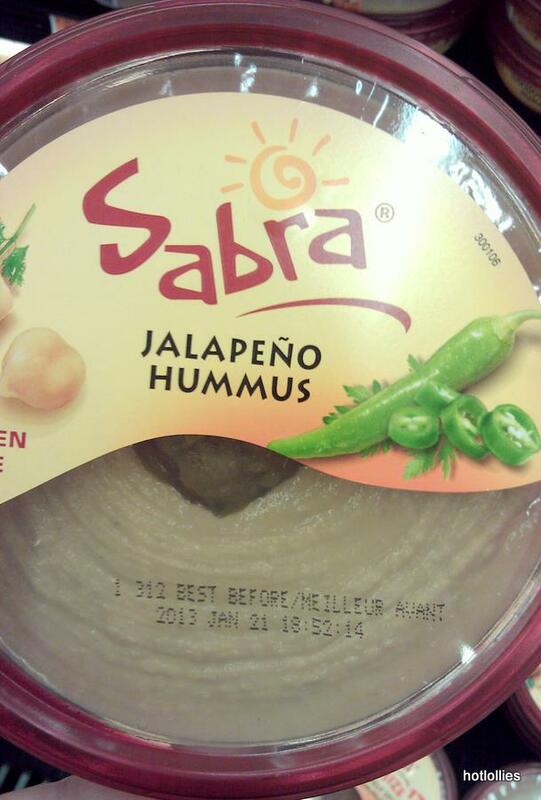 I can usually handle raw jalapenos and thought the jalapeno in this hummus was hotter than most jalapenos I’ve had. Even with the extra heat the hummus has great flavor and is smooth and creamy. The chipotle hummus shown above isn’t as spicy as the jalapeno version but also has great flavor. 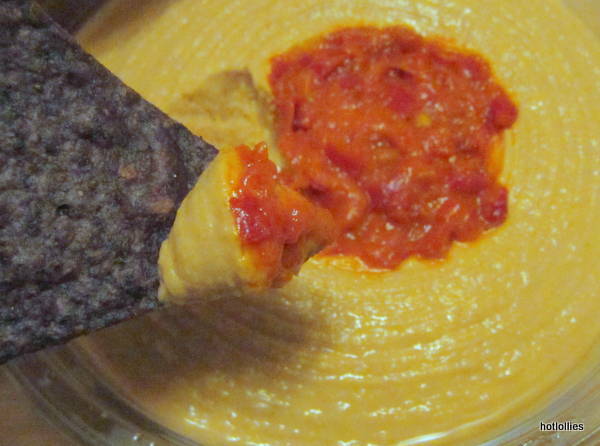 Hummus can be used as a dip for carrots, tortilla chips, pita chips or anything really. I’ve had hummus on toast before so go for what ever tastes good to you. I opted for organic blue corn chips for a Mediterranean Mexican twist! These would also be great for the upcoming football playoff games for a nice alternative to the greasy, fatty foods normally served up on game day. Let me know what you think about them. I wonder if the jalapeno version I got was a spicy fluke but I’ve tried it a couple times and they delivered! Happy snacking! When I made this dish I was thinking about the Cajun Red Beans and Rice but since I’ve been making beans since forever, I decided to spice it up Latin style. I used to have the Cajun version at an awesome restaurant in Belmar, NJ called Ragin’ Cajun many years ago. I haven’t been there in ages and not sure what it’s like now but man, the food there was insanely good. Everything was fresh, homemade, spicy and flavorful! Sometimes the owner/chef would step away from kitchen to check on customers. Always great food, always great service. From the spicy beef tips that weren’t always on the menu, the chicken baton rouge (my favorite! ), the shrimp etouffee, to the roasted whole garlic that melted like butter when you spread it over hot, crusty rolls…delicious, I can still taste it now! I have been wanting to go back but sometimes life just gets in the way. I read that the original owner is still there and do plan to get down there before the summer crowd and the crazy Parkway traffic starts. It’s just one of those places you never forget…I hope business has been good for them over the years. So even though I was thinking Cajun and have been wanting to travel to New Orleans for a while now for some good food, habit had me reach for the chipotle instead and went for more Latin flavors. I think I’m going to do a Cajun series though, or attempt to, although I’m not going to put okra in anything! That’s one veggie I just can’t stand…and celery. So be on the look out for a “Missing NOLA” recipe series. I love that place! 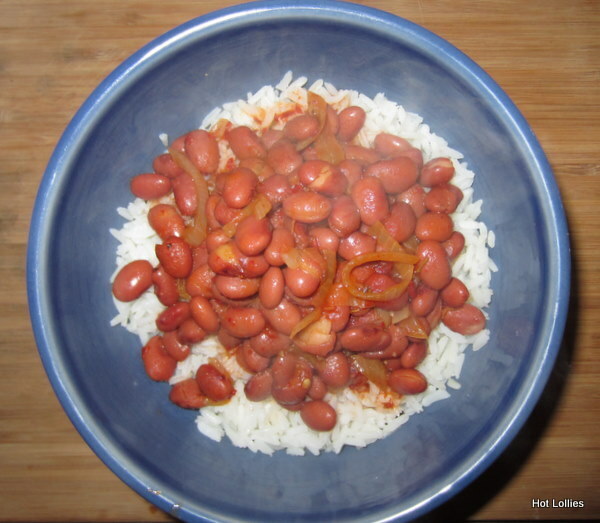 I prepared the beans the way my Mom taught me growing up; Dominican style but with lots of heat. It’s so easy and great if you’re looking for more hearty vegetarian options and gluten free dishes. This dish is loaded with carbohydrates but there’s also plenty of protein, fiber and sweat inducing heat that makes it a great balanced meal. I actually had it with slices of avocado sprinkled with a little salt but it never made it in the photo. I was so hungry I just wolfed it down! I also found this great chipotle sauce that I added to this recipe. It’s made by La Morena brand of canned chiles and sauces. I usually get their chipotle in adobo sauce, which is a must for any spicy food lover, and quickly grabbed a can while at my local market. When I got home I noticed it was just sauce and Oh My Goodness! So glad I did because this sauce was amazing. I hope you like this recipe! Heat oil in saucepan on medium heat. When oil is hot add the onions until translucent. Add tomato paste, chipotle sauce, garlic and stir vigorously until all ingredients are well blended. Add the kidney beans and stir. The beans will be a bit dry with just the paste and you want them to be saucy so add cup of water and stir. Add the ground pepper, red pepper flakes and cilantro and let mixture boil. Turn down heat and let simmer for 5-10 minutes. The beans are already cooked so idea is to let the flavors blend well and water boil off a bit, the beans should not be runny. You can remove the sprigs of cilantro when it’s done. For rice, heat about 2 cups of water on high heat in a separate saucepan and add salt to taste. Then add a tsp of oil and rice. Water should cover rice completely, about 1/4 in above rice level. Let water boil off and when this happens, turn heat to low and cover saucepan. Cook rice for about 20 minutes until fluffy. In a bowl, spoon beans over rice and serve while it’s piping hot. 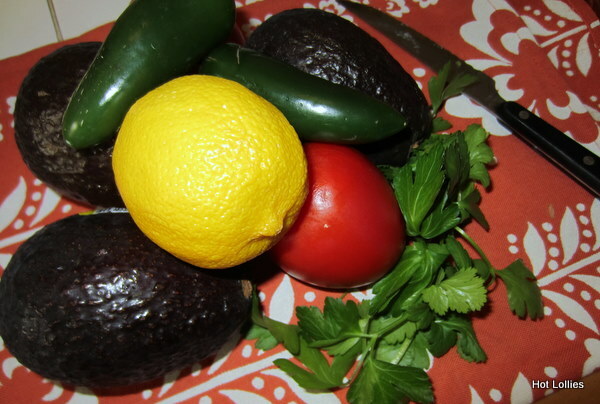 You can also add avocado slices seasoned with a pinch of salt. Who doesn’t like a great dip for the Superbowl? Here are a few recipes I have made that are both easy and satisfying. You can serve these with tortillas chips, pita chips, potato chips or crudites. 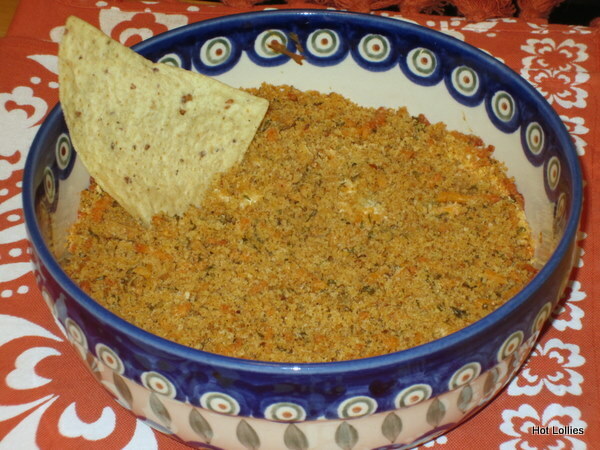 First on the list is the Jalapeno Popper Dip. I love jalapeno poppers but do not eat them often because well, it’s got a load on fat in it and it’s fried. In this dip version you’re shaving off quite a bit of fat but still keeping that great spicy flavor. When I made this the last time the bowl was practically licked! This recipe called for mayonnaise but I replaced it with plain yogurt and you really can’t taste the difference. Also, if you’re really watching your weight just dip a couple of chips and step away, no matter how tempting it is to hog the bowl. 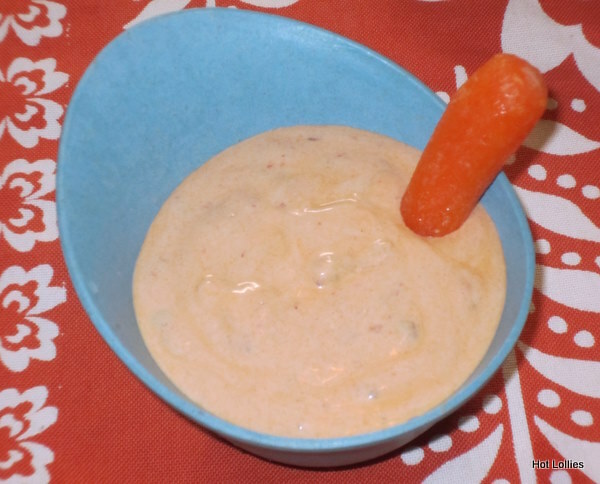 Mix soft cream cheese, yogurt, 3/4 cup of cheddar and jalapenos in a bowl until well blended. Transfer to an oven safe bowl. In a separate bowl mix breadcrumbs, remaining 1/4 cup of cheese and melted butter and sprinkle over the jalapeno mixture. Preheat oven to 350 and bake for 20 minutes. Serve with tortilla chips or veggies. Next up is the classic guacamole. Use fresh ingredients and keep it simple. Sometimes I’ll add half of a diced small red onion which gives it a nice bite but it depends who’s coming over. My sister can’t deal with onions and so I leave them out just for her. Other than that I really don’t like to mess with this recipe too much because its just perfect this way. Add avocado to bowl and break into cubes with fork, add chopped tomatoes, jalapeno, cilantro, salt & pepper, lemon juice and blend well. 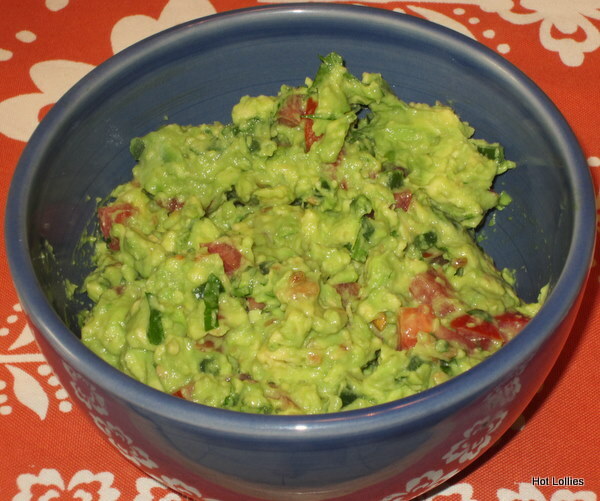 Do not over mix since guacamole, it should be chunky and not runny. Serve right away or place a layer of plastic wrap directly on top of guacamole, press down to get all the air pockets out and refrigerate. The lemon in the guacamole from browning but placing plastic wrap on top of the guacamole helps as well. If it does turn brown a bit just scrape the top layer off and it will be fine. Finally, this dip is amazing and very hot and spicy. You can serve anything with this. I even puree the mixture to use as a condiment sauce. Mix all ingredients in a bowl until well blended and serve with your favorite chips or vegetables. If you don’t have Greek yogurt you can use regular plain yogurt. The Greek version is a bit thicker and makes dip a bit more dense.